This jackpot slot from Novomatic is so full of fruit! If it were a fruit bowl, it would be overflowing with sweet and juicy, ripe fruits. Along with fruits, this 5-reel jackpot slot has a number of classic casino symbols, too. These include the bar symbols, the golden bells and the red sevens. Fruit Magic doesn’t really have a theme that goes far beyond ‘slot game’. Having said that, traditionalists will certainly enjoy the simplicity of this game. At the end of the day, a slot machine doesn’t need a special theme or crazy graphics to be fun to play. You spin the reels of a slot game to get wins, not necessarily to see advanced graphics or anything like that. Fruit Magic certainly gives some mighty wins. Plus, there’s a stupendous jackpot to be won! There isn’t much else to say about Fruit Magic that makes it stand out. Nevertheless, it’s a very enjoyable slot to play. It’s such a traditional-style slot, you’ll feel like you’re playing it in a Vegas casino while you are playing in a Novomatic casino. Even the sounds and the music are totally classic. The logo is green and gold gothic writing. This is at the top of the 5 reels. To the right of the logo, you’ll be able to see the jackpot amount. This will slowly rise as you play the game – until someone is lucky enough to win it! Below the reels, you will see your balance and your last win amount displayed. 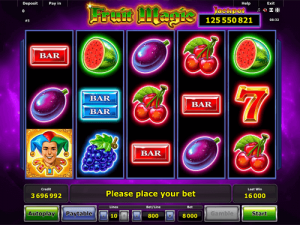 Fruit Magic has 10 paylines and you can increase or decrease your bet per line by using the plus and minus buttons. You can play Fruit Magic manually by pressing start to spin the reels once. If you want them to keep on spinning, just need to press autostart. This will keep them spinning until you choose to stop. The magic of this game is in the symbols. They’re so totally signature Novomatic symbols, you’d spot them a mile off. The least valuable symbol, and the only symbol that awards a payout for 2 matches, is the cherries. The orange, the lemon and the plum give the same payouts as the cherries but they don’t award a payout for 2 matches – they only give wins for 3, 4 and 5 matches. The other symbols are the same, they give wins for 3, 4 and 5 matches. The matches need to land on active paylines for you to be paid the win. The identical symbols must fall from the leftmost reel and then on adjacent reels thereafter. Symbols that have more value (and bigger payouts) include: the golden bell, the grapes, the watermelon, the single red bar, the double blue bar, the triple green bar, the red seven, the jolly jester and the Scatter symbol. The jolly jester also gives a win for just two matches. The Scatter symbol pays from any positions. Scatter symbols can ignore the paylines and the consecutive reel rule! The paytable displays all payout amounts for every symbol. You can openthe paytable of the slot Fruit Magic by pressing the button at the bottom left of the screen. The paytable updates automatically when you adjust your bet. In addition to being able to pay from any position, the scatter symbol also starts Free Spins. 20, to be precise. You can keep on getting more and more Free Spins so that number could easily go up to 100 in one go! Another 3 or more scatters in one spin will award 20 extra free spins. Remember the jolly jester? He’s the wild symbol so he’s extra special. He can step in and help to complete any win. Whichever symbol you’re missing in a combination, the jolly jester can come to the rescue! His substituting powers only don’t extend to the Scatter symbol. So he can help you get any win, just not free spins. But wait, there’s better news! Every win he helps to award by means of substitution, he doubles! Another way to get double wins is to get the free spins. All wins are doubled in the free spins, not just the jolly jester wins. Whoever is lucky enough to get the reels to land with 5 jolly jesters in view will be awarded the jackpot!